All positions are filled for 2019. If you are interested in working here in the future, see below for job descriptions. Feel free to contact us with any questions. Description: The job will primarily be vegetable work (planting, weeding, harvesting, washing, etc.). It will also include other tasks such as washing eggs, animal feeding/fencing/rotation, and tractor work. Through your work you will learn about the day-to-day workings and management of a for-profit diversified farm. We offer a friendly and organized work environment, as well the opportunity to interact with the people who are buying the food you are producing. Schedule/hours: 5 days per week, approximately 40 hours. The position runs April through November, though part-time hours will be available sooner if desired. Compensation: $13-14/hour plus eggs, milk, yogurt and vegetables. To apply: send resume, brief paragraph explaining your interest, and 3 references to: oldfordfarm@oldfordfarm.com. Please indicate that you are applying to the seasonal position. Description: The main responsibility will be running all aspects of the dairy operation. This includes caring for cows (fencing, feeding, etc. ), milking, and bottling milk. Other jobs will include collecting eggs, animal fencing/rotation, all aspects of growing vegetables, and tractor work, among other farm tasks. Through your work you will learn about the day-to-day workings and management of a for-profit diversified farm. We offer a friendly and organized work environment, as well the opportunity to interact with the people who are buying the food you are producing. 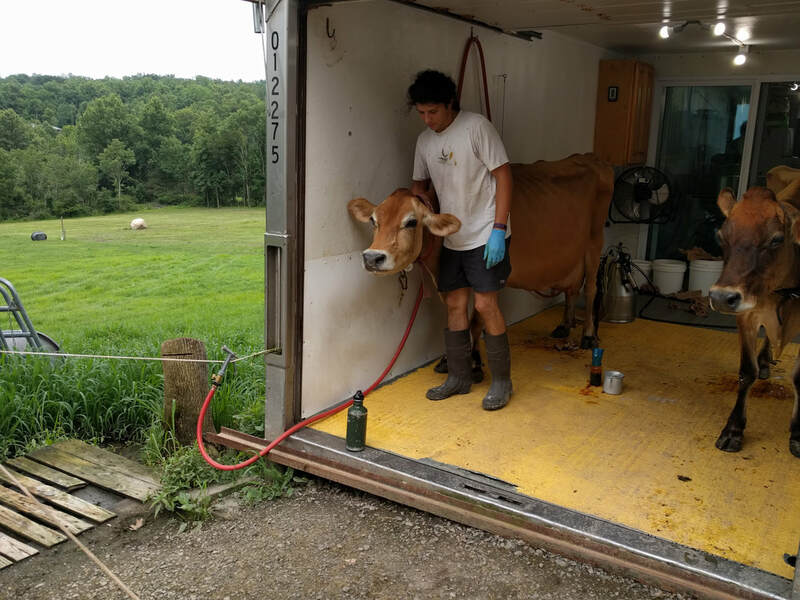 Schedule/hours: The morning milking is 6am - noon and the evening milking is 4pm - 8pm. This position is for 7 milkings per week. Additional shifts of other farm work can be added if desired during the growing season. A one-year commitment is required. The position can start as soon as it is filled. Compensation: $15/hour plus eggs, milk, yogurt and vegetables. To apply: send resume, brief paragraph explaining your interest, the date you are available to start, and 3 references to: oldfordfarm@oldfordfarm.com. Please indicate that you are applying to the milking position.